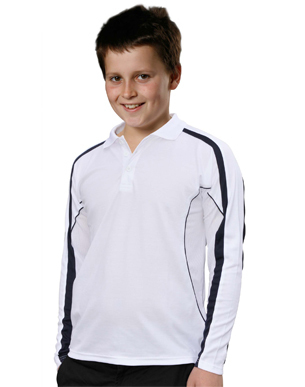 Kids TrueDry® Long sleeve Polo TrueDry® Mesh 160gsm - 60% Cotton,40% Polyester Breathable mesh panels under arms & on sides. Long sleeves. Contrast panels and piping on shoulders and sleeves-front and back. Black/gold, black/red, black/white, maroon/white, navy/gold, navy/red, navy/sky, navy/white, red/white, royal/white or white/navy.